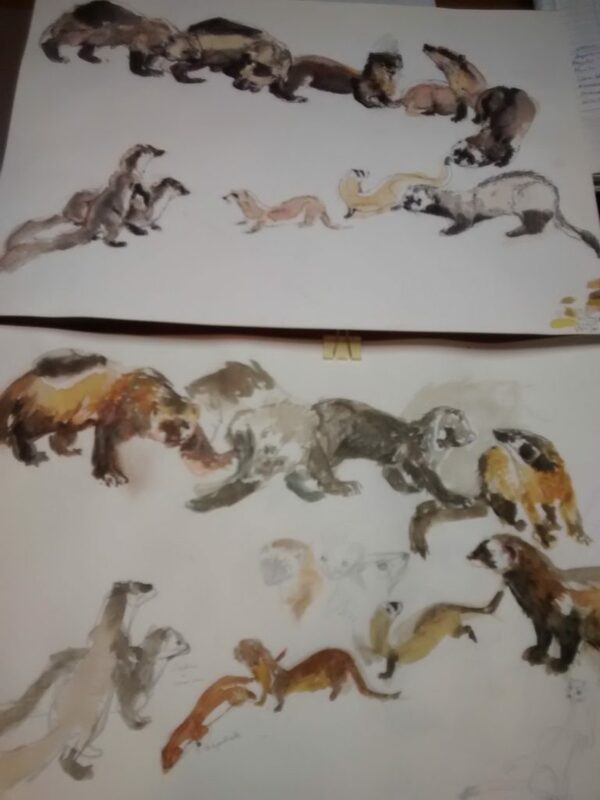 One thing I have always wanted to do (and to which I have dedicated many years, although intermittently, when circumstances permit) is an illustrated book about Mustelids and Small Carnivores. Along my adolescence I was very inspired by the work of the Dutch illustrator Rien Poortvliet (The Gnomes, Dogs) and her fresh and wonderful style of sketches. I have always wanted to do something similar … with my limitations, of course! I love mixing the different techniques to achieve the texture and movement of these restless animals that I like so much. Una cosa que siempre he querido hacer (y a la que llevo muchos años dedicados, aunque de manera intermitente, cuando las circustancias lo permiten) es un libro ilustrado de mustélidos y pequeños carnívoros. En la adolescencia me inspiró mucho la obra del ilustrador holandés Rien Poortvliet (Los Gnomos, Perros) y siempre he querido hacer algo similar… ¡con mis limitaciones, por supuesto! Me encanta mexclar las diferentes técnicas para lograr la textura y movimiento de estos inquietos animales que tanto me gustan. 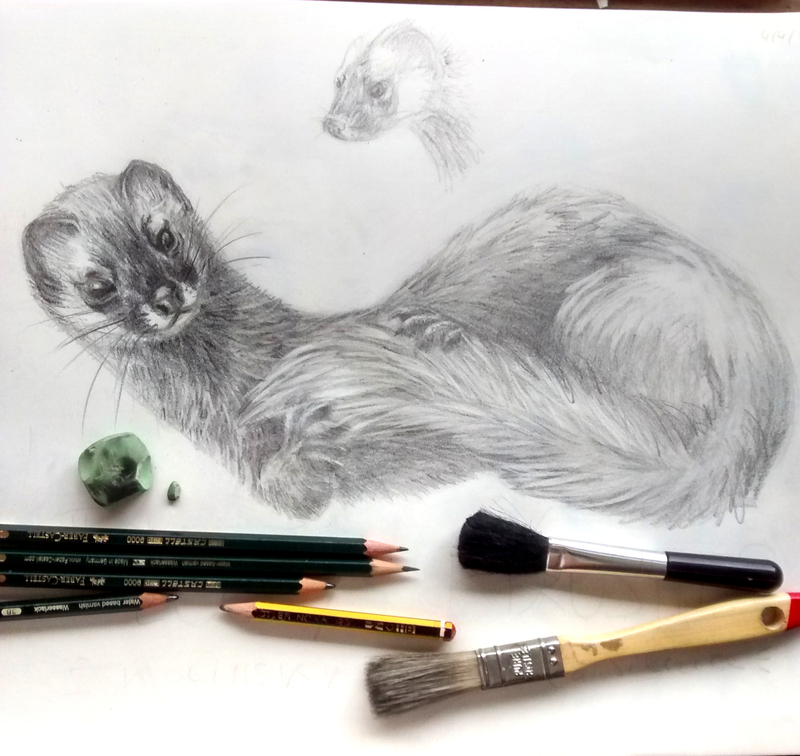 Here, a pencil drawing of Siberian weasel (Mustela sibirica) or “kolinsky”, popular for providing the hairs that are used for artistic brushes that we use for watercolors. Of course, I not use them a long time ago and I only have synthetic-hair brushes. I have been preparing these days, taking advantage of the natural light that the long days of spring give us. 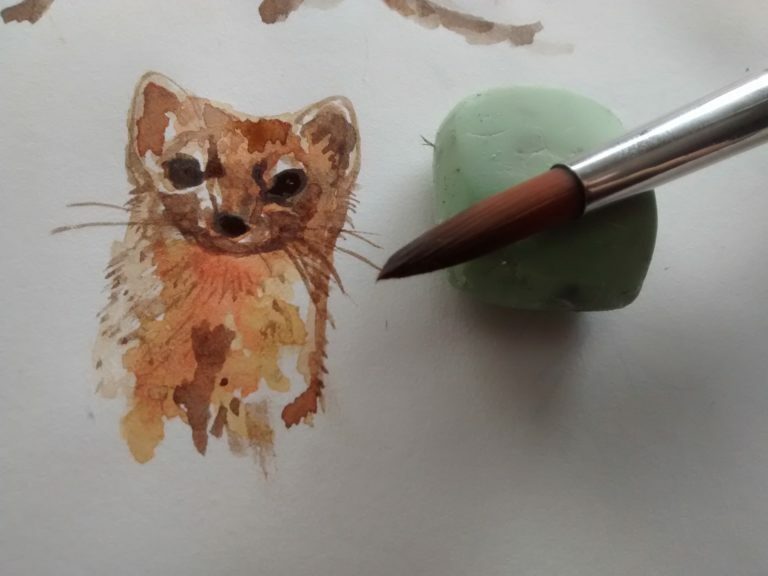 Aquí, una ilustración a lápiz de visón de Siberia (Mustela sibirica) el famoso “Kolinsky”, tan popular por proporcionarnos los pelos que se utilizan para pinceles artísiticos que usamos para las acuarelas. Por supuesto, yo hace tiempo dejé de usarlos y sólo tengo pinceles sintéticos. La he estado preparando estos días, aprovechando la luz natural que nos proporcionan los días largos de la primavera. 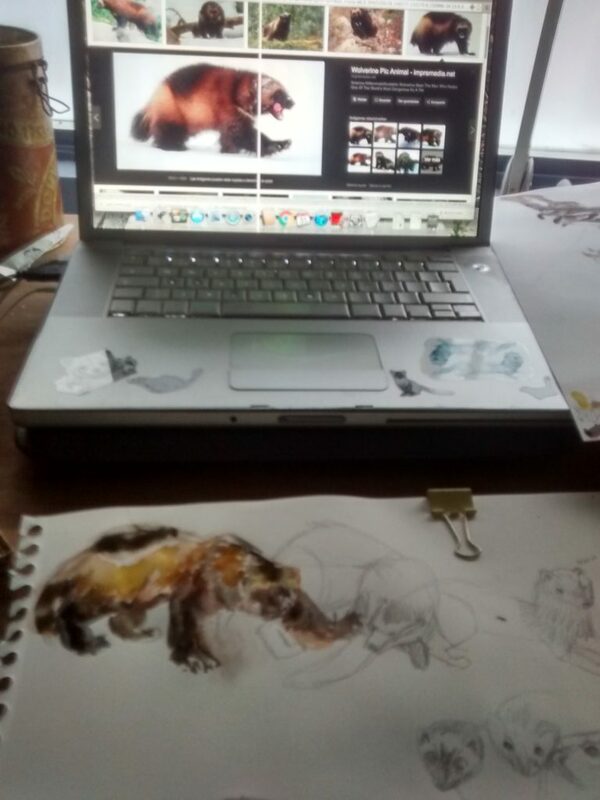 I like to draw inspiring in many photographs for search different poses of the body and the color patterns in the fur. 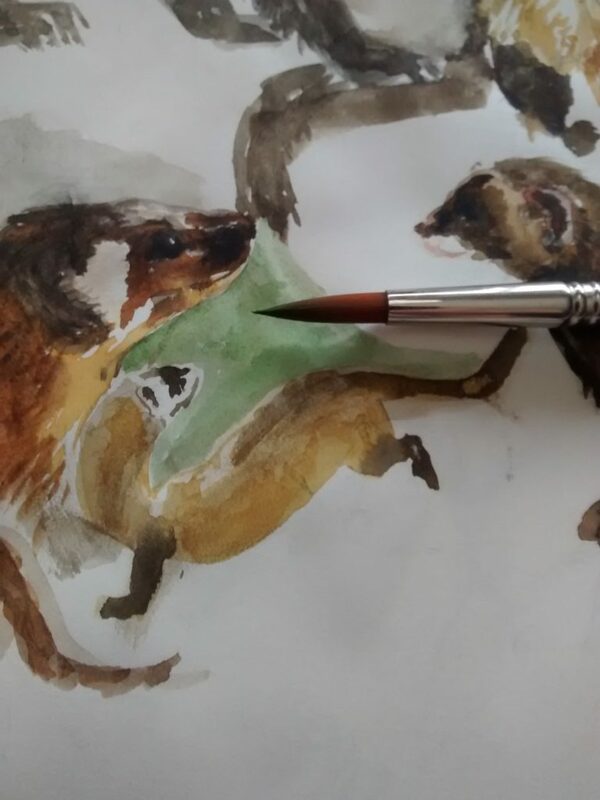 Despite its brown tones, I find the mustelid´s fur patterns very interesting. Me gusta dibujar inspirándome en diferentes fotografías e investigar las diferentes poses del cuerpo y las estructuras del color en el pelaje. Pese a sus tonalidades pardas, me resultan muy interesantes los distintos patrones que el pelaje ofrece.